If it takes Black History Month to spark excellence on BET (Black Entertainment Network), so be it. I am talking about that station's airing this week of The Book of Negroes, the three-part miniseries based on the award-winning 2007 novel of the same name by Canadian author Lawrence Hill (which was originally published as Someone Knows My Name in the US, and rereleased under its original name this past January). 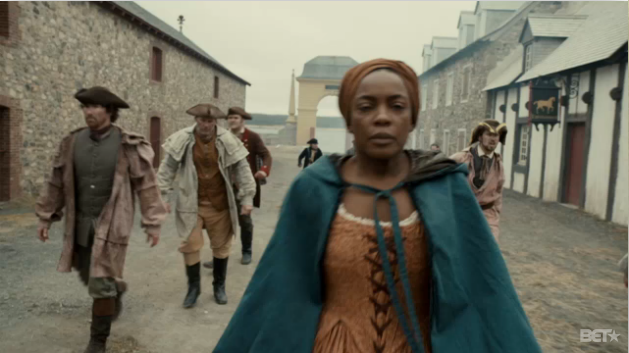 Co-written by Hill and Jamaican-Canadian director Clement Virgo, and produced by Guyanese-Canadian Damon D'Oliveira and Virgo, the miniseries, original in six parts, initially premiered on Canadian Broadcast Channel TV in January, and was, to my mind, not just compelling TV, but utterly perfect in its historical and diasporic dimensions for Black History Month. The series, and Hill's novel, draw from the historical Book of Negroes, which the British Army, after its defeat in the US Revolutionary War, compiled as a means of documenting which people of African descent, many of them enslaved, had escaped to the British lines and aided its war effort. Those who could vouch for their contributions and who had no standing claims as chattel nor debtors were guaranteed their freedom and passage to Nova Scotia. Some 3,000 people qualified. In Hill's novel, which fictionalizes and reshapes the story, an enslaved woman, named Aminata (later Meena) Diallo and raised in the Muslim faith, from Segou in what is now Guinea, plays the central role in recording the names, later going on to testify before a select committee of British legislators in order to help end the British Slave Trade. In fact, the novel and miniseries center on Aminata's experiences. When we first see her, she is a child (Shailyn Pierre-Dixon) with her parents in Africa. Shortly thereafter, after hearing a djeli, or traditional storyteller, she is captured by slavers, assisted by a young native, Chekura Tiano (Siya Xaba), and on the slave ship, we see the early sparks of her lifelong as she provides the means for a near slave rebellion, which is violently quelled. Aminata and Chekura survive the Middle Passage, and she ends up on a South Carolina plantation owned by the lecherous Robertson Appleby (Greg Bryk). Here, as elsewhere, Aminata/Meena never forgets her family, Africa or her past; now into early womanhood (and played with aplomb and fearlessness throughout by Aunjanue Ellis), she befriends one of the older enslaved women, Bertilda (Cara Ricketts), who serves as a surrogate mother, and reconnects with Chekura (now the strapping, handsome Lyriq Bent), who manages to make infrequent nocturnal trips to see her, and uses the fishnet (or "slave grapevine," an effective proto-telecommunications system) to keep abreast of what she is up to. Much of this early portion of the story unsurprisingly parallels the usual depictions of plantation slavery, though Virgo's direction is assured throughout; a vile master, the hardships of the enslaved people, punishment for defiance. In Aminata's case, her relationship with and pregnancy by Chekura, whom she marries without the permission of and in defiance of her master Appleby, leads him to sell off her daughter May to unknown owners and eventually her to Solomon Lindo (Allan Hawco), a Jewish trader who becomes the witting and unwitting catalyst for Aminata's liberation. Witting, because his wife Rosa (Amy Louise Wilson), fosters the multilingual, perspicuous Aminata's skill at reading and writing. Unwitting because after Rosa's and the Lindo's child death from smallpox (and here, we get a strange moment of present-day irony because Bertilda had innoculated Aminata so as to protect her from the pox's ravages), Solomon takes her to New York, where she will serve and assist him in his business affairs. The trip coincides with the stirrings of the Revolution, though Aminata's taste of freedom begins when she encounters free black people, including free black tavern keeper Sam Fraunces (Cuba Gooding, Jr.), who is smitten with her. (The depiction of Black Sam, both in Hill's book and the miniseries, takes some liberties, but some contemporaneous accounts apparently did describe Black Sam as a "mulatto" or mixed race person.) Aminata flees to precarious freedom among the city's black encampment while Solomon heads back to South Carolina, and Chekura, having learned of her whereabouts, finds her in the City. He also volunteers for the British side, as does she as an aide to Captain John Clarkson (Ben Chaplin). This creates the conditions for their unqualified freedom and her role as the author of the official Book of Negroes. To give just a bit more of the plot, Aminata and Chekura find themselves separated when authorities prevent her from boarding the ship bound for Nova Scotia because of a standing claim on her--but not by Solomon. It is Robertson Appleby, instead, who tries to game the law and gain control of Aminata before she can get away. Miraculously, Sam Fraunces produces (!) Solomon, her former owner, and countermands the claim, in the process and in court manumitting Aminata, though she tempers his heroic gesture by reminding him that she cannot forgive his role in selling off her infant daughter May. In Birchtown, the black settlement in Nova Scotia, Aminata emerges one of its leaders alongside preacher Daddy Moses (Louis Gossett, Jr.), but the economic and social conditions for the newly arrived black population remain shaky before they find themselves at the hands of rioting whites who blame for the loss of jobs and other privations. The British have set up a colony in Africa, Sierra Leone, which Aminata and Chekura and nearly 1,000 other blacks from Canada will head to, together, and while there, in addition to helping to establish Freetown, the capital city, she hopes to see her native village again. As it turns out, Chekura is able to redeem his participation in their enslavement, though with tragic consequences; Aminata does find another village mirroring her native one, which may no longer exist; and she ends up, in her final chapter, moving to London to assist Captain Clarkson. It is there that she pens her own autobiography, despite the disbelief of her white abolitionist supporters and opponents (reminiscent of Phillis Wheatley's attestation), which with her testimony will play a key role in ending Britain's participation in the slave trade. There is a final, moving and lovely twist, which exists in both the novel and miniseries, and which the story certainly earns. 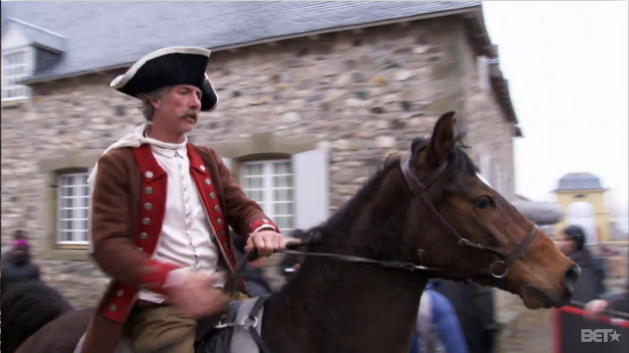 There are moments of anachronism throughout the series; at one point I felt, based on the dialogue in revolutionary New York and in Nova Scotia, as if I were watching a mashup of MTV and 1776; at another, at the very end, when Aminata participates in an outdoor public book-signing, which might have been possible though it seemed unlikely from a historical standpoint, it took me momentarily out of the story. All of the enslaved and free men are a bit too buff (a fact I am not really complaining about). In addition, though the screenplay mostly avoids sentimentality, but it does crop up at points, such as when Aminata and Chekura reunite in New York, but I chalked this up to the demands of portraying a story of such complexity that a little shorthand was necessary and not worthy of a quibble. 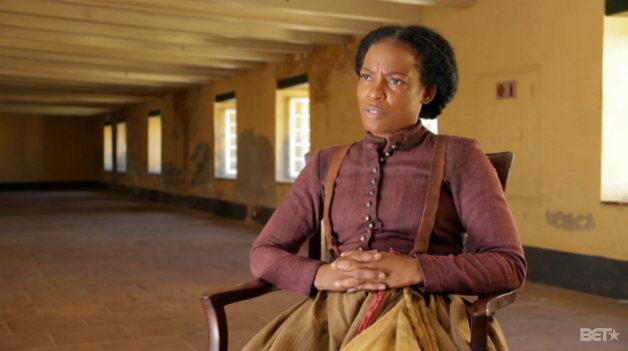 What works throughout is Aunjanue Ellis's characterization of Aminata. She fully inhabits this visionary figure of resistance, showing vulnerability when required but also conveying an inner fortitude that would have made possible the vast journey she traveled. 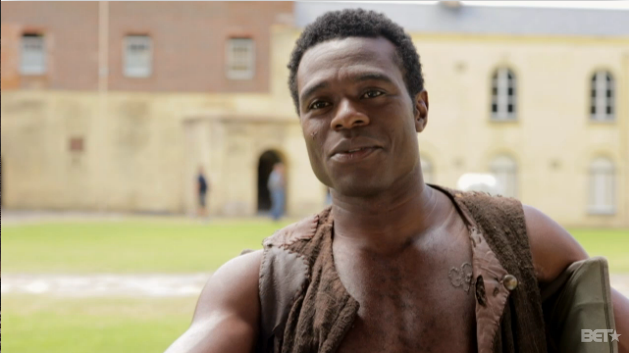 Lyriq Bent also is strong as Chekura, and though he has less to do and say throughout, he succeeds in embodying the sort of man who could steal through the night, despite all obstacles, to be with her, and who is willing to make the ultimate sacrifice to atone for actions he could not have fully understood in his youth. Veteran actor Jane Alexander exudes the right combination of liberalism and racism in her depiction of Nova Scotian printer Mary Witherspoon, while Louis Gossett, Jr., as Daddy Moses, radiates joy in his role. 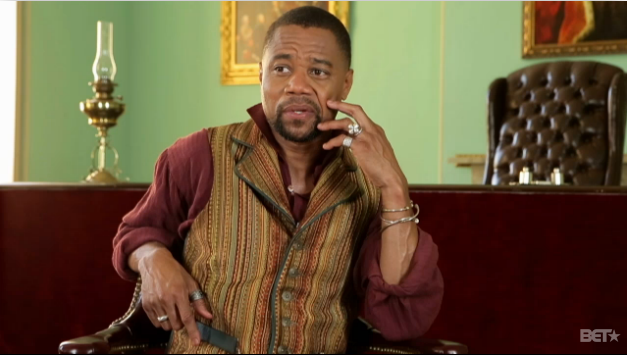 I could not, however, stop thinking that I was watching Cuba Gooding, Jr., as opposed to Fraunces, but accepting this I was able to enjoy his scenes. This was true too for some of the secondary actors, who were uneven, but a few, like Matt Ward as Jason Wood, and Stephan James as Cummings Shakspear, endowed their characters with vivacity and gravity. All in all, I was impressed with the rich cast of mostly black Canadian and South African actors, and now want to see them--along with their African American, British, and Afro-Latin peers--much more frequently on screens, large and small. Other aspects of the miniseries are even stronger. The adapted screenplay transforms the novelistic material in appropriate ways, while also never faltering in its ability to properly and effectively depict expressions of black solidarity, love, and, between Aminata and Chekura, eros and tenderness. Another pinnacle is the cinematography. From start to finish, though it occurred primarily in Cape Town, South Africa and Nova Scotia, it sensorially and visually anchors each scene, whether the grim edged pastoral of Appleby's plantation; the frenetic (though perhaps far too clean) streets of revolutionary New York; and the chilly, snow-doilied hills of Birchtown and Nova Scotia. Even the period interiors, if sometimes too sumptuous when depicting the enslaved people's quarters, place viewers firmly in a past time and space. In terms of pacing, the series never lags. Each two hour installation races by--and around BET's sally of ads. I could easily have stood several more nights of this fascinating tale, though that would have gone beyond the novel's and story's scopes. As entertainment, The Book of Negroes is a triumph, but it also succeeds in its efforts to highlight a still too-little known aspect of American, African American and African Diasporic history. In essence, it presents the history of black Loyalists, who had everything at stake by agreeing to support the British. It also shines a light on the contributions of a black woman who was unwilling every to cede her agency if she could help it, and in so doing, helped to change one of the most abominable systems that has gripped the globe. The novel and miniseries succeed in their efforts to present a fuller social and political economy of the slave trade, of black resistance and freedom, and of a feminist perspective on our histories--and herstories. I recommend, and will say don't forget the popcorn and the tissues for the tears that may come along the way, before you get to cheer at how this particular story does end on a high note. 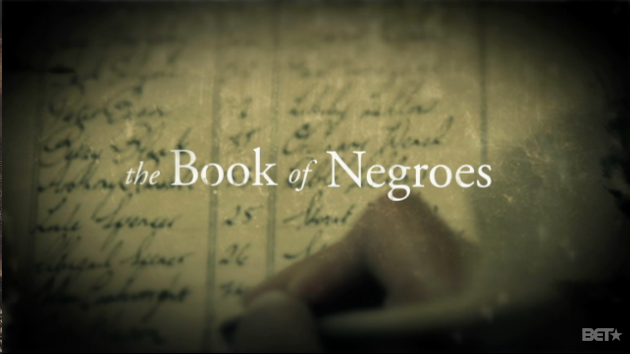 For more about The Book of Negroes' historical facts and context, BET even has an iPhone/Android app! 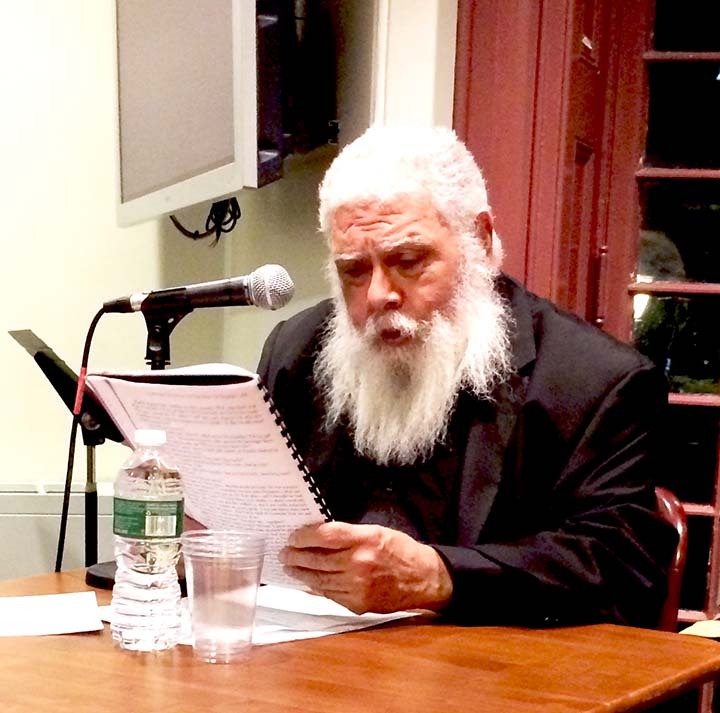 Last April 11 in Philadelphia, the Kelly Writers House at the University of Pennsylvania organized a tribute to Samuel R. Delany (1942-), "Motion of Light," honoring his "performative poetics." Though I always associate Chip Delany with his native New York City, he has taught at Temple University for over a decade (and will be retiring this year), and has become an integral member of that city's literary communities, so it was fitting that he was honored there. A number of admirers of Delany's work were present; though invited I was already booked at a conference (&Now) in Colorado, so I sent my contribution, "Paean," to Tracie Morris, one of the organizers, to present in my absence. The original event was archived at PennSound. Now Tracie has edited a special section at Jacket2 featuring some of the events' tributes, including work by Kenneth R. James, Ira Livingston, Sarah Micklem, Fred Moten, Jena Osman, Frank Sherlock, Anne Waldman, Tracie herself I, and, as well as Chip offering his own contribution to the event through a concluding conversation with Charles Bernstein. 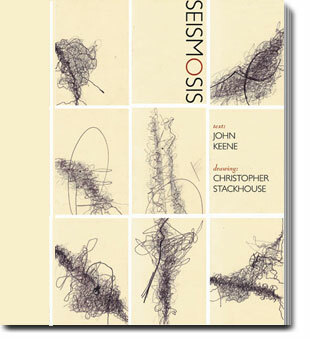 Although Chip needs no introduction and his work as a creative writing, critic and intellectual could fill a month-long conference, if you're interested in seeing others speak (or create Möbius strips in response) to his poetics, the Jacket2 features offers a fine introduction. Moved movers amid the intensity of the pas de deux my offering asks you to imagine, Delany and Taylor are bound in what Denise Ferreira da Silva would call the affectability of no-bodies. Bound for that embrace, they hold, in their openness, to its general, generative pattern. Openness to the embrace moves against the backdrop of exclusion and the history of exclusion, which is a series of incorporative operations. This is how openness to being affected is inseparable from the resistance to being affected. Dance writes this push and pull into the air and onto the ground and all over the skin of the earth and flesh that form the city. The words of these moved movers have something specific to do with dance and I want to talk about that specificity as an interplay between walking and talking, between crossing and tasting, between quickness and flavor. Their words and work form part of the aesthetic and philosophical atmosphere that attends the various flows and steps that have taken place in and as New York City over the last fifty years, especially downtown in the serially and simultaneously emergent and submergent dance space between two churches, Judson and St. Mark’s. eBooks, Surveillance and a New Aesthetics? Perhaps five year ago when, at hiring and committee meetings, readings, or during the rare non-literary performance (as in the crazy Raymond Roussel play John Beer directed with such aplomb in Chicago), I would pull out my iPad and read from it, my use of this technology would spark comments and queries. 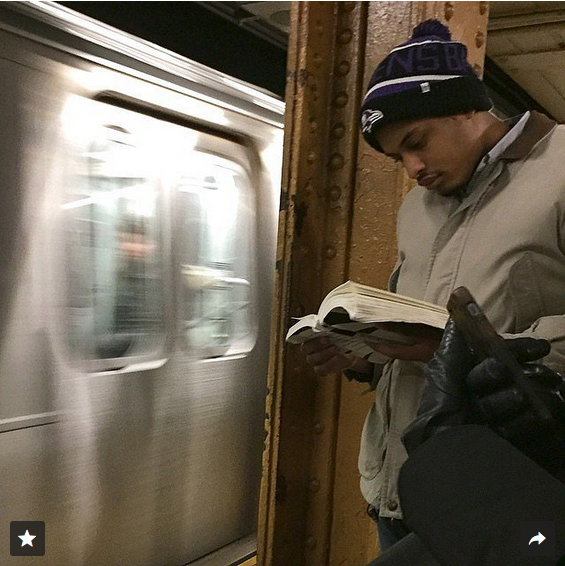 I seldom saw people reading from an iPad, let alone another e-Reader, in public spaces, including on the MTA subway trains, and even less so on the El, though I did spot a number of early adopters on my flights commuting between Jersey City and the Windy City. My status as a tablet/e-book harbinger, however, did not result from any innovative thinking on my part; it was the direct result of living with an app developer who had bought two machines to test his work on, and I ended up with the more basic one. There was little likelihood that I would have gotten one so quickly otherwise. Still, convenience, physiological comfort, and to some degree costs, make strong arguments on behalf of e-books and e-devices. Rather than having to carry about heavy hardcover or even lighter but still bulky paperback books, as I have done for most of my life, you can store hundreds (thousands?) of books on many e-reading devices, which have increasingly shrunk in their physical dimensions to the point that some are not much bigger than the largest smartphones. (Compare an iPad Mini or smaller Kindle reader to one of the larger Android phones, or Apple's news gigantic iPhone.) On most e-readers you can enlarge print with a swipe or a button, obviating the need, as your eyes age, for squinting at tiny print. E-books also tend to be less expensive (as they should be) than codex books, and with most--all?--e-reading devices you can also easily read .pdfs of anything you can transform into that format, which today is anything you find on a laptop or tablet screen. A vast array of literature can be found free of charge on the web, such that an enterprising person could--and some have--cobble together from existing materials an ever-changing, personalized e-anthology. Kobo also revealed that the people of Britain were most likely to finish a romance novel, with 62% completion, followed by crime and thrillers (61%) and fantasy (60%). Italians were also most engaged by romance (74% completion), while the French preferred mysteries, with 70% completion. I wonder what American readers tend to finish the most. Fantasy? Nonfiction books? Something not listed above? Even raising such questions underlines the basic fact that the collection of data is a form of surveillance. Neither Prose nor the Guardian report says whether the data collection is voluntary, but I imagine it is similar to most online data collection today, which is to say, you have to opt out, sometimes with great difficulty. But then it isn't just online sites that are collecting data. A few years ago on these pages, I raised an uproar over the warrantless wiretapping George W. Bush's government was engaging in, but as Wikileaks and other whistleblowers, including most importantly, I'd argue, Edward Snowden have certified, the surveillance of everyone, via a variety of increasingly networked means, is widespread. To put it another way, every networked device, as well as every data point collected by any means possible, becomes the means to follow, track, quantify, and monetize our existences. Everything we do that can be tracked can be commoditized, among other things. The most sinister aspects of this panoptic society remain to be reckoned with. Since Kobo is apparently sharing its data with publishers, writers (and their editors) could soon be facing meetings in which the marketing department informs them that 82 percent of readers lost interest in their memoir on page 272. And if they want to be published in the future, whatever happens on that page should never be repeated. Other than Kobo, it appears most publishers are not (yet) willing to share the full data they have been collecting, but an earlier article along these lines made me wonder about not only about how publishers and readers might respond, which is the ultimate focus of Prose's article, but rather, within a specular regime of surveillance of writers' aesthetic choices how writers ourselves might start to respond as the data haul increases and we have an ever clearer picture of how readers are moving through books. (This also may be of great interest to the big data researchers now active in literary studies.) 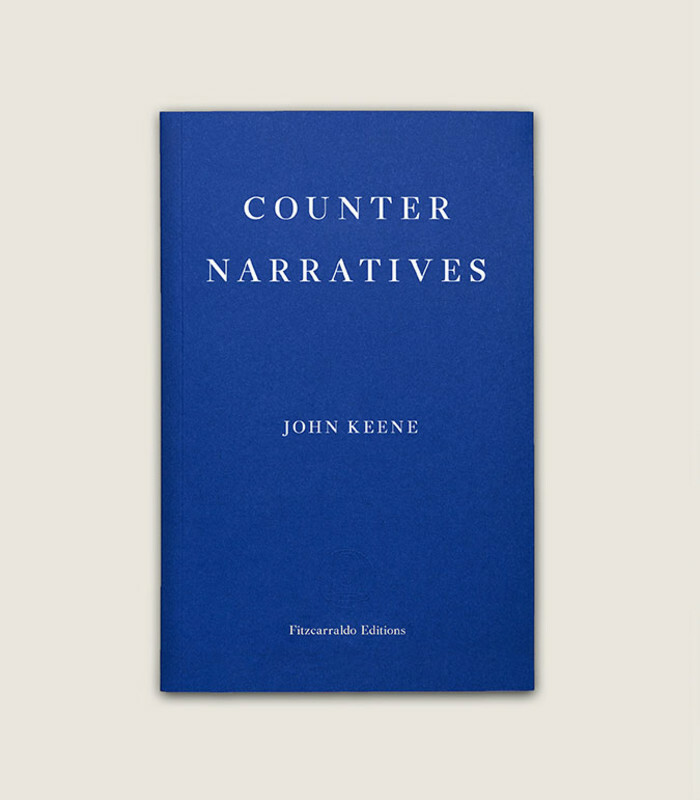 Publishers, agents and editors already push fiction and nonfiction writers toward certain themes and topics, as well as towards certain styles of writing that have proved, at least by empirical standards, to result in books that readers will purchase, whether they read them all the way through or not. With this new data, analogous to how we modify our behavior (or don't) based on the expectation of widespread surveillance, might some of us start to make even more specific aesthetic decisions based on the data, aware that it's always being collected and will be shared with us? As things already stand most authors, whose work draws upon the prevailing discourses, frameworks, ideas, and rules of the era in which we are writing, already grasp the parameters for readership and publication, but this is often intuitive, with some recourse to empiricism. For example, most writers know an 800-page novel is going to be harder to sell than one that's 400 pages, though the example of Tartt, Foster Wallace, Catton, and others suggests that it's not impossible. Also, most writers know that language that is too baroque, too ornate, too lyrical, to subtle, and so no, will repel most, though not all, readers off, although the example of Cormac McCarthy's The Road, to give one fairly recent example, suggests that the right writer can write in a prose as finely wrought as that found in the Bible or Shakespeare's plays, and still sell books. (And that McCarthy novel is, I would argue, significantly more simple in its language than an earlier book of his, like Blood Meridian.) Most writers know that certain genres, and the conventions embedded within them--romance, mystery, horror, science fiction, speculative fiction and fantasy, etc.--sell far more than realist literary fiction, though there are authors who successfully, in aesthetic and market terms, blend and bend all of these genres. If an emerging or even established fiction writer, to take one example, not only wants to get her work into print, but to have readers engage with it and finish it, however, awareness of these data, let alone the specific data points assembled in descriptive--or prescriptive and proscriptive form--might begin to function like a template or paint-by-numbers guide. How to write? Shorter sentences and paragraphs; stock characters (young, upper middle class, physically abled, white) with certain winning descriptors (the default "blond(e)" or "sun-kissed"); prose so simple and shorn of rhetorical devices a second grader could read it without breaking a sweat; rigid Aristotelianism in terms of form; faster pacing; muted, middle-of-the-road politics; boilerplate, normative sexualities; and so forth. You could call this "e-data aesthetics," I suppose, and in some cases a writer may feel it benefits her work aesthetically. For others, of course, it could prove problematic, on multiple levels. If you know readers in general do not like complex syntax, to much figuration, and complex characters, but you are drawn to write such things, will you change to please (and gain?) readers? These days such questions may appear farfetched, but you need only look at the increasingly rigid, money-driven template Hollywood employs with regard to mainstream filmmaking to recognize that once enough writers proceed from such premises, it will change writing dramatically. It may help certain writers reach a level of competency, but it may harm the talents and aims of others. This is not to say that won't be other mechanisms, including forms of technology, social and cultural attitudes, as well as economic criteria, and so forth, at play, that determine what people are writing, but "e-data aesthetics" are something we might want to start thinking a bit more about, since the data are only growing and the means to aggregate them are steadily growing too. At her Hullabaloo blogsite, Digby posted the remarks Justice Carlton Reeves, the second African American to serve on the federal bench in Mississippi when he was appointed by President Barack Obama in 2010, delivered when he passed down sentences against three young white men who were part of a larger group that brutally beat and ran over a black man, James Craig Anderson, in Jackson, Misssissippi, in 2011. Justice Reeves gives an excellent overview of the racially motivated hatred that still plagues the US, so following Digby's lead, I am reproducing a sizable chunk of his commentary from the bench. I recommend reading the whole thing. The Bollingen Prize for American Poetry, administered by the Yale University's Beinecke Library, is one of the most prestigious awards of its kind. Since its initiation in 1948 by the Library of Congress, in a firestorm of controversy because of the inaugural winner, avowed fascist and bedrock Modernist Ezra Pound, it has recognized many of the US's most important and innovative poets. The Bollingen shifted to its home at Yale by 1949, and originally was conferred on a yearly basis until 1962, when it switched to a biennial calendar, in some years honoring two poets at the same time. Throughout its history nearly all the honored poets have been white and the overwhelming majority male, and this has mostly remained the case, though some of the country's greatest women poets, including Marianne Moore (1951), May Swenson (1981), Adrienne Rich (2003), and most recently Susan Howe (2011). 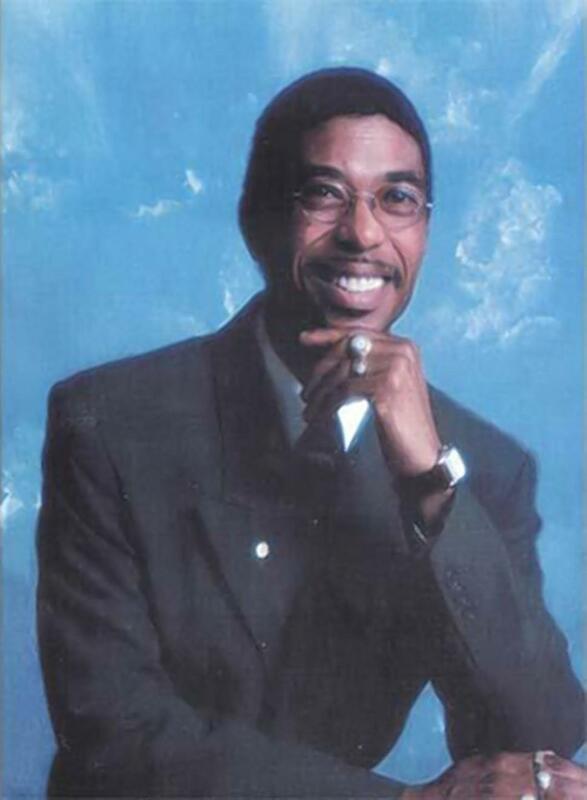 The sublime Jay Wright was the first African American recipient of the award, which I recognized in my very first post at J's Theater in 2005. Yesterday another extraordinary, prolific poet--as well as fiction writer and critic--Nathaniel Mackey, has been selected to receive the Bollingen Prize. Mackey first came to wider public notice when he won the National Poetry Series in 1985 for Eroding Witness, but he has been publishing his poetry since 1978's Four for Trane, for a total of nine books or chapbooks of poetry, and a forthcoming tenth volume, Blue Fasa, to be published this year by New Directions. His collection Splay Anthem, also published by New Directions in 2006, received the National Book Award for Poetry. Among the other awards he has received for his work are the Stephen Henderson Award from the African American Literature and Culture Society, a Whiting Writer's Award in 1993, a Guggenheim fellowship in 2010, and the Ruth Lilly Prize from the Poetry Foundation in 2014. 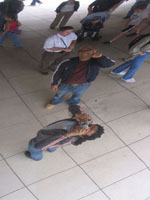 In 2001, he was elected a Chancellor of the Academy of American Poets, serving until 2006. He currently is Reynolds Price Professor at Duke University, and has for decades published the literary journal Hambone. I must note Mackey's fiction as well; he has published four novels that together constitute another serial project, this time in prose: From a Broken Bottle Traces of Perfume Still Emanate. The first volume, Bedouin Hornbook, published in 1986, went off like a volcano when I first came across it during my Dark Room Collective days. I still have that volume, which I peer into periodically; it is a book that, like its intense and probing companion volumes, From A Broken Bottle Traces of Perfume Still Emanate: Bass Cathedral (2008), Atet A. D. (2001), and Djbot Baghostus's Run (1993), could sustain repeated and extended readings--and studies--for years. Congratulations to a nonpareil writer, Nathaniel Mackey! Before I post a poem by Nate Mackey, I wanted to offer congratulations to all the writers nominated for this year's National Book Critics Circle Awards, which will be announced on March 12. It is a remarkable lineup, and I can say that I know and admire the work of many of the nominees, and reviewed one of the books, Ian S. McNiven's biography of James Laughlin, a few posts back. Among this year's honorees, Claudia Rankine, a poet whose work I hold in the highest esteem, was nominated not only in the poetry category, but also in the criticism category for her superlative volume Don't Let Me Be Lonely, which should have received the National Book Award last fall. My brilliant former Northwestern colleague, Eula Biss, who received the National Book Critics Circle Award a few years ago, was nominated again in the criticism category. Another former Northwestern colleague, Chris Wiman, who was also the editor for many years of Poetry magazine, received a nomination in poetry too, as did Saeed Jones, a dazzlingly talented young poet who graduated from Rutgers-Newark a few years before I started, and Willie Perdomo, a superb poet I've known and read since my early 20s. Also, the great Toni Morrison, who received the National Book Critics' Circle Award for her 1977 novel The Song of Solomon, will receive the Ivan Sandrof Lifetime Achievement Award. Congratulations to Claudia, Christian, Eula, Rasheed, Willie, and all the other nominees! “Song of the Andoumboulou: 50” from Splay Anthem by Nathaniel Mackey, copyright © 2006 by Nathaniel Mackey. New Directions Publishing Corp., all rights reserved. 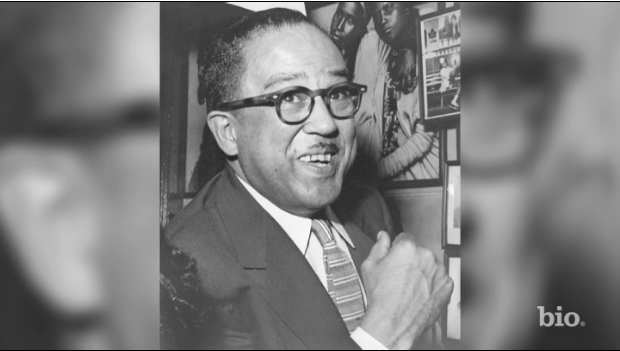 February 1 always marks the start of US Black History Month, as well as the birthday of one of the greatest poets this country gave the wider world, James Langston Mercer Hughes (1902-1967). I think I've alternated in the past by celebrating one or the other, but today, in tribute to the month and to Hughes, here are a few of his poems, all taken from The Collected Poems of Langston Hughes, Arnold Rampersad and David E. Roessel, Editors (New York: Vintage, 1995). The first is a poem drawn from Hughes's time on the sea; Sekondi, part of Sekondi-Takoradi, is a port city in Ghana. Note the ironic play on fog and the swift punchline-like turn at the poem's end. Here are three queer poems drawn from Hughes's collections up to 1936. I reread all the poems in these volumes in preparation for my story "Blues," which involves a (fictional?) meeting between Hughes and the Mexican poet Xavier Villaurrutia, who had already translated some of Hughes' work into Spanish. In his first three or so collections, Hughes has, among a wide array of poems in which a male voice addresses a female beloved; a female voice addresses or speaks of a male beloved; and gender-ambiguous poems, many invoke nocturnal imagery (because we all know what goes on in the dark). Bare your bosom to the sun. You who are a child of night. Lastly, Hughes was a poet who did not shy away from political and social commentary, but he had a gift for figuring out how to express it without it (for the most part) sounding like propaganda. Part of his success hinges on his use of humor, part on his careful use of rhyme, rhetoric and rhythm, part on his inclusion of vernacular and the viewpoint of the subaltern, and part on his skillful deployment of irony. The parodic tone and collage quality here point in the direction of post-modernism. "Advertisement for the Waldorf-Astoria" appeared in 1931 in New Masses magazine, and later in Hughes's aubiography, The Big Sea, and is considered a masterpiece of Popular Front aesthetics. I checked the Inflation Calculator, and $10,000/year in 1931 would equal $155,747.37/year in 2014 dollars. That would come to about $12,978/month, which, it turns out, was about the price of the lowest end rentals in the Waldorf Towers in 2011 (I can only imagine that it has risen by several thousand dollars as the price of high-end real estate keeps rising.) To put it another way, Hughes was prescient, and not for the first time! "A lease, if you prefer, or an arrangement terminable at will." All poems Copyright © Estate of Langston Hughes, 1995, 2015. All rights reserved.